Why should your Facebook page be any different than your website? Optimising your Facebook page for SEO will help draw more eyes onto your business page. Like any web page there are ways to improve the chances of it being found online via search engines. 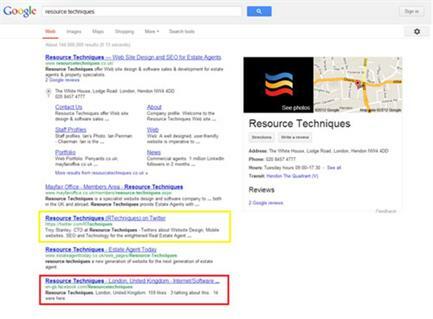 As you can see below, just by searching “Resource Techniques” both our Facebook page (in red) and our Twitter page (in yellow) can be found on the first page of Google. But like all SEO strategies, you can go overboard so be sure not to add too many keywords. Always write for people and not the search engines. This is an obvious way to improve your chances of being found, however you do need to obtain more than 25 fans before Facebook will allow you to change your page’s URL to include a custom name. This should include your company name to make it easier for the search engines to find your page. If your company name is taken, try something else that relates to your business but be sure to keep it simple. This is one of the most important sections of Facebook as it allows you to give a brief description of what you do. You can use it to include a URL link as well as to implement one or two keywords you want your page to optimise for (e.g. Letting Agents York). If you have committed to posting regularly on Facebook you are likely to post images and possibly videos too. With these you can include a description and URL link which could further help the optimisation of your page. Keywords within the description will give your content more of a chance of appearing on Facebook’s internal search as well as Search Engines in general. When you post a link you are able to edit both the heading and the description underneath. Be sure to add in your own description with specific keywords.